It seems like the only location that would make any sense would be to the left of the sink, replacing the cabinet whose door is open, and the cabinet to its left. It’d block access to the sink, which isn’t exactly ideal, but I can’t see any other way I could reasonably access the water supply and disposal. I guess maybe I could replace the cabinet on the end of the counter (leftmost in that photo) and run pipes through the backs of the other cabinets? That seems like a somewhat long pipe run, and the pipes would be somewhat exposed. Assuming replacing the blind cabinet is the way to go, though, I’m unclear on how exactly I’d go about doing that. I don’t think I can just slide the entire cabinet out, and besides, it’s supporting the countertop. But I don’t know how I’d go about safely cutting out the portion that’s “in the way” either. Any advice would be greatly appreciated. Thanks! Sawzall! Or, more seriously: Sawzall for the major cuts, a decent Japanese pull saw for the face cuts where you need to be precise. In a perfect world, I’d put it between the sink and the stove (although it is nice to have drawers next to the stove), but I’m guessing that’s only 18” wide. The cabinet between the sink and the stove is actually less than a foot wide. It’s not very useful. Any thoughts on removing the end cabinet instead of the blind corner cabinet and running hoses along the backs of the other cabinets? Wow! That drawer and door, plus the fascia beside it, are less than a foot? That’s pretty narrow. I’d have no problem running feed lines out to the blind corner cabinet, I fear running drains. But if you’ve got 3” or so behind the drawers I guess there’s no reason not to run the drain out that far (and if you don’t, then you could just shorten one drawer). I think you’d need to join pre-trap under the sink, and if it ever starts smelling run an empty load to flush it out. (Putting in an additional trap near the washer and joining the main sewer line I’d think would risk siphoning the trap). I’m a bit limited on my knowledge of plumbing, but I don’t think smell would be an especially big concern as long as the dishwasher is run regularly. It shouldn’t take too much water to clear out even a relatively long drainage hose. I definitely don’t want to have a special drainage connection just for the dishwasher, though; that’d mean cutting through the foundation slab and would just generally be a huge pain. In terms of kitchen usability, I think removing the non-blind cabinet at the end of the countertop would be preferable. We’d be able to access the sink while the dishwasher is open. But it means running the hoses behind the other cabinets (which probably means shortening a couple of drawers and maybe protecting the hoses with a PVC sheath or something), and the hoses would be a relatively long run. The only difficult thing plumbing-wise is the drain. What kind of plumbing do you currently have? Feed-line wise, you might build a box or something to protect PEX in the back, but if you were going to run copper or PVC… well… just put it in there. And the only reason you’d have a smell issue on your drain is if it weren’t getting totally flushed. The more I’m thinking about this, the more I’m thinking that you should go for the blind cabinet. If I were you, and there is space to do so, I’d shift the stove over to give you the 30 inch width that most D/W’s have. I have done a cpl of D/W installs in previous homes. Having it on the right of the sink makes it easier to work with it. Also the plumbing will be easier but, what about your stovetop exhaust? Is it overhead, vented somewhere? If it’s just a filtered overhead then it’s easy and I’d do it that way. Good luck! Installing a Dish washer in your kitchen is not like having a great deal but many choices that may be getting confused to you.Wooden blinds or Window would be the better choice which I prefer to use for that. Return it for a model thats not as deep and will fit properly in the opening that you have. If I were you I would move the sink, move it over to the left section where it can then have the dishwasher located right next to it. This is then much easier to coordinate in a kitchen; plates go in the sink or straight in the dishwasher. You can then leave all the back wall area, where the sink was removed from, as counter space for working more conveniently next to the stove. Your kitchen will look and run a lot more efficiently and the plumbing involved isn’t too great a job. 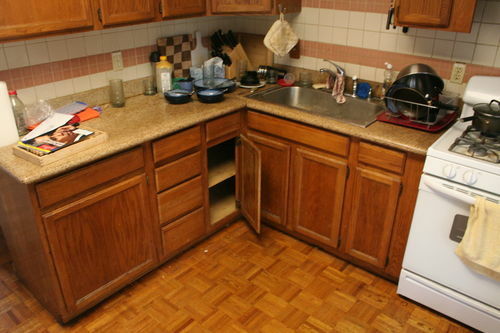 Cabinets are required on either side for … Don’t install a dishwasher adjacent to a corner run of cabinets …. Working with Square Corners/Blind Cabinets. Try using sliding door for the front area of the sink, it is the type of door match that specific place area. It is easy to open and close and a proper position while washing stuff in the sink is really that maintain. Check this site http://caldwells.com/exterior-doors/front-doors they have perfect cabinet front door in different design, color and use. I’ve got to say that I think replacing the end unit might actually be a more feasible and aesthetic solution. BUT plumbing will be a bit of an issue if you have to lay pipes behind the cupboards – that would mean that you can’t keep all the water-related parts together.. I’m thinking that you may want to consider getting the side panel redone anyway just to make sure that everything is sitting properly. Don’t know if you have access to the underside of this floor? That would be the way to run all your new lines if possible. You may also have to build support under your counter to stiffen it where you remove a cabinet. You could also do what many new homes are doing to cut down on cabinet space. Building in 2 dishwashers. 1 is used for dirty dishes and 1 for clean. No cabinet space is needed for dish storage as the clean are only removed when used, and then placed in the other to be washed. I would ideally put the dishwasher in between the stove and the sink, but as you mentioned, it is a less than a foot wide only. Use a Japanese saw in order to cut thru the storage cabinets, but the place you’ve chosen seems not ideal. I know where the storage right now that you are considering to put the washer is accessible to the sink, but it will be very tight. I follow this topic to had a pic when it will be done.